Mrs Brown's Boys will return for two festive shows on the BBC, with other Christmas highlights including a French and Saunders reunion. Comedy duo Dawn French and Jennifer Saunders are together again for the first time in 10 years, to mark their 30th anniversary. Victoria Wood is being celebrated with Our Friend Victoria, which will show clips of the late comedian. Other shows include Peter Capaldi's final Doctor Who episode. 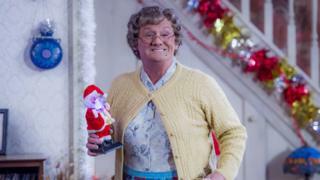 The two Mrs Brown's Boys episodes, which will air over Christmas and New Year, come after recent revelations that three of its actors were allegedly involved in a tax avoidance scheme. Leaked documents showed Patrick Houlihan and Martin and Fiona Delany transferred their fees to companies in Mauritius and sent money back as loans. The trio did not respond to the BBC's request for comment when the story broke earlier this month. Our Friend Victoria will include anecdotes from Wood's famous friends, including Dame Julie Walters, Anne Reid and Reece Shearsmith. Shearsmith also returns with Steve Pemberton, Mark Gatiss and Jeremy Dyson in three new episodes of The League of Gentlemen on BBC Two. There's more comedy on BBC Two with Alan Partridge: Why, When, Where, How and Whom? - a documentary looking at the character's career. It will feature interviews from the team of writers and performers who created Partridge, including actor Steve Coogan, as well as archive footage from the past 25 years. Mary Berry will reunite with Mel Giedroyc and Sue Perkins for the first time since the trio left The Great British Bake Off. Big Christmas Thank You will see them visit a community centre in south Wales to bring festive cheer. Doctor Who fans will see Peter Capaldi take on his final battle before he regenerates into the 13th Doctor - played by Jodie Whittaker - in the show's Christmas special. Dramas include the crime thriller McMafia starring James Norton, and adaptations of Little Women, starring Dame Angela Lansbury, Sir Michael Gambon and Emily Watson, and Jessie Burton's The Miniaturist. Despite the fact they're celebrating 30 years together, the French and Saunders special is called 300 Years of French & Saunders. It promises new material as well as previously unseen footage from their back catalogue. Lulu will be among their special guests. The usual specials from programmes like Call the Midwife, Still Open All Hours, Not Going Out, Top of the Pops and Strictly Come Dancing will also be on offer. From the stage, Matthew Bourne's Cinderella and A Christmas Carol Goes Wrong will both feature along with Puccini's opera La Boheme.